Energetic particles from the magnetosphere continually bombard the upper atmosphere, producing auroral emissions and modifications of the properties of the neutral and ionized gas of the upper atmosphere and ionosphere. The energy for these processes comes from the solar wind. Solar activity leads to strong disturbances within the solar wind and thus to a highly variable transfer of energy from the solar wind to the magnetosphere, ionosphere, and upper atmosphere. 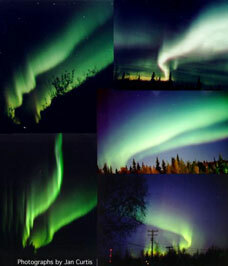 This variability leads to an intriguing variety of disturbances within the magnetosphere, which couple to the ionosphere, leading to auroral emissions and ionospheric currents, The study of these disturbances using ground-based and spacecraft-borne instrumentation is a major topic of research within the Department. An important goal of this research is to use ionospheric disturbances to probe the coupling to magnetospheric processes and to the solar wind disturbances driven by solar activity. Boudouridis, A., L. R. Lyons, E. Zesta, and J. M. Ruohoniemi (2007), Dayside reconnection enhancement resulting from a solar wind dynamic pressure increase, J. Geophys. Res., 112, A06201, doi:10.1029/2006JA012141. Millan, R. M. and R. M. Thorne (2007), Review of radiation belt relativistic electron loss, J. Atmos. Sol. Terr. Phys., 69, 363-377. Lyons, L. R., D.-Y. Lee, C.-P. Wang, and S. B. Mende (2005), Global auroral responses to abrupt solar wind changes: Dynamic pressure, substorm, and null events, J. Geophys. Res., 110, A08208, doi:10.1029/2005JA011089. Thorne, R. M., T. P. O’Brien, Y. Y. Shprits, D. Summers, and R. B. Horne (2005), Timescale for MeV electron microburst loss during geomagnetic storms, J. Geophys. Res., 110, A09202, doi:10.1029/2004JA010882. Boudouridis, A., E. Zesta, R. Lyons, P. C. Anderson, and D. Lummerzheim, Effect of solar wind pressure pulses on the size and strength of the auroral oval, J. Geophys. Res., 108 (A4), 8012, doi:10.1029/2002JA009373, 2003. Horne, R. B., R. M. Thorne, N. P. Meredith, and R. R. Anderson, Diffuse auroral electron scattering by electron cyclotron harmonic and whistler mode waves during an isolated substorm, J. Geophys. Res., 108, (A7), 1290, doi:10.1029/2002JA009736, 2003. Lyons, L. R., C.-P. Wang, and T. Nagai, Substorm onset by plasma sheet divergence, J. Geophys. Res., 108 (A12), 1427, doi: 10.1029/2003JA010178, 2003. Mauk, B. H., R. M. Thorne, and B. J. Anderson, Magnetosphere-ionosphere coupling at Earth, Jupiter, and beyond, Atmospheres in the Solar System: Comparative Aeronomy, Geophysical Monograph 130, ed. M. Mendillo, A. Nagy, and J. H. Waite, pp 97-114, AGU, Washington, D. C., 2002.